Raf Simons rilegge la moda di Dior alla luce di un nuovo minimalismo: partendo dal passato, dall'underwear di epoca vittoriana fino alla giacca iconica della Maison, il designer si concentra sul futuro, su ciò che è moderno oggi. La collezione è dunque un incontro di maschile e femminile, accenni romantici e rigore militare, classicismo e contemporaneo. Semplice, ma super femminile, in pieno stile Dior, questa collezione racchiude lo spirito di Monsieur Christian e la visione estetica di Raf dimostrando ancora una volta che la vera modernità non è altro che la rilettura e la commistione di epoche passate: top e shorts ispirati alla lingerie si alternano a tailleur dall'aplomb preciso, i lunghi abiti fluidi con gli chemisier da indossare con maglie brevi, le gonne asimmetriche con le giacche dalla silhouette allungata. A bohemian romantic take permeates the latest offering by Alexander McQueen. Sarah Burton proves once again that she is Alexander’s worthy successor and delivers one of her most beautiful collections in which every looks is a craftsmanship masterpiece. Feminine, but never predictable, with the right amount of drama, oneiric as in the brand’s signature style, the collection mixes long frilled pieces with lace dresses layered over masculine trousers, torn jeans topped by asymmetric tail coats, knitted sheaths and slip dresses in embroidered leather. Fashion is a game or, better, it’s a videogame. 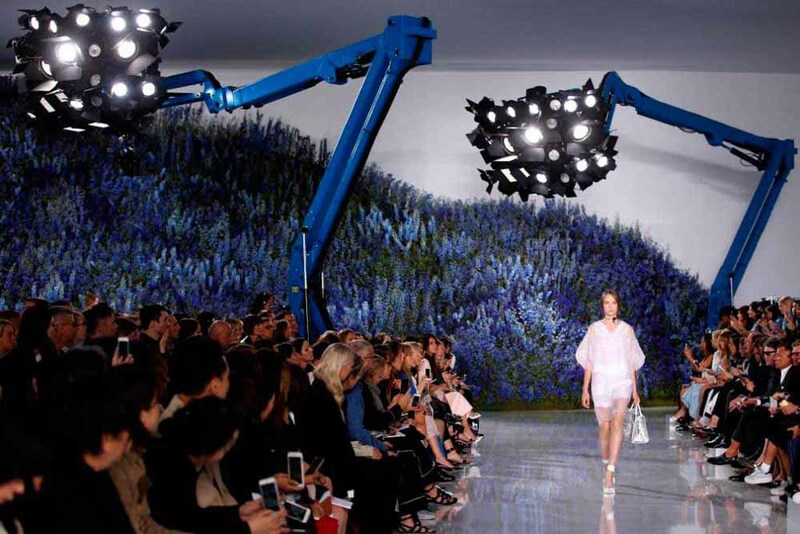 Nicolas Ghesquière takes Louis Vuitton into the future. Within the setting of the LV Foundation, the French designer presents one of his best and most accomplished collections since he has been at the helm of the house: women of virtual perfection invade the runway like heroines of a videogame, wearing utilitarian jumpsuits or monogrammed biker jackets, paneled skirts and flouncy tops, or leather shorts and gilets. Little rigid bags that look like treasure chests or crocodile maxi bags, platform sandals and metal toed boots top of the look of this super-elegant couture-like Lara Croft. Rei Kawakubo belongs to a superior creative category that blurs the border between fashion and art. Her shows are increasingly more akin to an artistic performance that stages a mysterious vision with such powerful evocative power to not require any interpretation. There is a ritual and dramatic quality to her shows, a celebration of absolute intensity from a visionary talent that transcends the belonging to the fashion system. The reference this seasons is a "Blue Witch", a spellbound and bewitched creature with flaming hair, wrapped in an elaborate fabric and feather cocoon that makes her similar to a magical and poetical winged creature or to the totem of an exotic and unintelligible culture: the image lingers long in the memory like the unforgettable stories of a fairy-tale book.